If the soil is poor and the site uneven, topsoil should be applied to the area. A sandy loam soil is a good idea, which is good for draining and leveling. Ensure the surface is leveled and raked and free from stone, other debris and any weeds. By not taking enough care to level a site, the higher areas will be scalped by the mower, which can cause brown patches. A light application of lawn fertilizer such as Turfbuilder or Organic Extra, should be spread over the area. Lay turf as soon as possible after delivery. Never lay the turf and let the sun beat down on it for any lengthy period before watering. Start laying rolls of turf preferably along a straight side in a row and in a brick like fashion so that joints are staggered, but closely end to end. Ensure rolls are close side by side, but not overlapping. Avoid leaving gaps between rolls in hope that they will grow together. A light rolling with a medium weight lawn roller is advisable to ensure the under side of the turf comes into contact with the soil. Immediately after laying the turf, start watering. It is important to give the turf a really good soaking. The turf must be kept well watered for the first couple of weeks. Once the lawn is established, water occasionally - mainly during dry periods. Couch: Start mowing after 10 days from laying during spring or summer, or 3 weeks during autumn or winter. 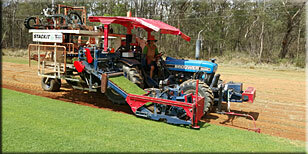 Buffalo and Zoysia: Start mowing after 21 days from laying during spring or summer, or 4 weeks during autumn or winter. Be careful not to set your mower too low, reduce height gradually or you may scalp you lawn.